There was a significant increase in the number of organizations that made some sort of change to their performance management process between 2016 and 2017, according to Brandon Hall Group’s Performance Management surveys. It’s clear from Brandon Hall Group’s Performance Management research in both 2016 and 2017 that organizations are serious about evolving from a process-centric to more of a people-centric system, and migrating performance from an administrative process to a development process. The pace may not be as fast as many would like, but there was a significant increase in the number of organizations that made some sort of change to their performance management process between 2016 and 2017, according to Brandon Hall Group’s Performance Management surveys. Several processes have undergone change from an administrative process to more of a people-focused process in both 2016 and 2017. Some of those changes have had a strong impact on Key Performance Indicators (KPIs), such as employee engagement, employee productivity, participation in development opportunities, and even the difficult-to-improve category of employee retention. But, as the research shows, a critical component in moving from process-focused performance management to people-focused performance development, is actually involving people, both those being evaluated and their managers. Our analysis shows that organizations that embraced actively involving employees in the PM process—whether they had made systemic changes or not—were much more likely to see gains in KPIs than organizations that did not involve employees. We looked at the impact of recognizing employees for strong performance, involving employees in performance assessments, and training managers—formally or informally—on performance management. We found strong correlations between these practices and critical business metrics. While involving and recognizing people in performance doesn’t necessarily cause these KPI gains, the statistics indicate that these practices play a positive role and help make the case for employee-centric performance management. Organizations that regularly recognize their employees for high performance—whether they acknowledge blockbuster achievements, meaningful contributions, or both—have a stunning advantage in key metrics over organizations that lack formal recognition programs. Approximately three-quarters of organizations regularly recognize achievements in some way. More than 2.5 times more likely to experience increased employee engagement. 85 percent to 100 percent more likely to see increased employee productivity. 61 percent to 76 percent more likely to have employees participate in more development opportunities. The research shows a strong correlation between active employee participation in the performance management process, and increases in employee retention, participation in development opportunities, productivity, and engagement. The most common type of employee participation is a self-evaluation. 60 percent of organizations determine the format and give little or no employee discretion. 40 percent allow employees to submit a free-form self-assessment that includes personal and professional goals, development opportunities of interest, and other items they believe should be taken into consideration as part of the assessment process. 2.5 times more likely to see increased employee retention. 52 percent more likely to see increased employee productivity. 50 percent more likely to see increased participation in employee development opportunities. 44 percent more likely to see increased employee engagement. More than three times more likely to see increased employee retention. 56 percent more likely to see increased participation in employee development opportunities. 52 percent more likely to experience increased employee productivity. 33 percent more likely to experience increased employee engagement. In order to get the best results from performance management, managers need to understand the process and how to involve employees. Approximately 86 percent of organizations deliver some sort of performance management training to managers. It is not surprising that organizations that provide training fare better than organizations that don’t. But the gaps in KPI gains are staggering, not only in employee engagement, retention, productivity, and participation in development activities, but also in customer satisfaction and retention, organizational revenue, and market penetration. 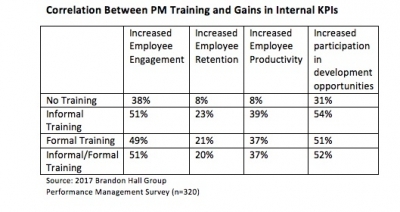 While training doesn’t necessarily cause these KPI gains, the statistics indicate that the performance management training certainly plays a positive role. Organizations can disagree about the relative merits of separating merit pay from the performance appraisal process, or eliminating forced distribution. But the merit of actively involving employees in the performance management process—both those being appraised and their managers—is difficult to dispute. Less than half (40 percent) of organizations utilize a free-form self-assessment in which the employee being appraised can include personal and professional goals, development opportunities of interest, and other items they believe should be taken into consideration as part of the assessment process. If nothing else, organizations should see that getting employee input is critical. The KPI statistics make this abundantly clear and give employees, managers, and HR professionals plenty of ammunition to make their case. 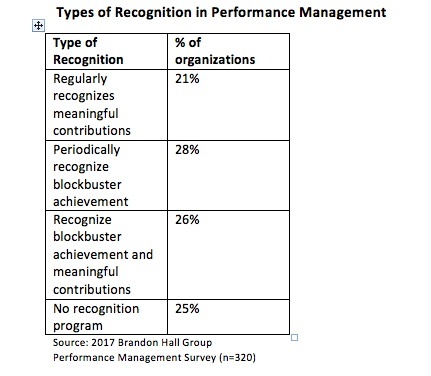 Recognition is well documented as a critical element of talent management, and has been supported by many studies, by Brandon Hall Group and across the industry. That 25 percent of organizations in our research don’t offer any type of recognition program related to the performance management process is mind-boggling. It just doesn’t make any sense from a business standpoint and an engagement standpoint. Claude Werder is VP/Research Operations and Principal HCM Analyst at Brandon Hall Group, an independent research/analyst firm in the human capital management market. The firm’s vision is to inspire a better workplace experience, and its mission is to empower excellence in organizations around the world through its research and tools. Brandon Hall Group has five HCM practices, produces the Brandon Hall Group Excellence Awards, and the annual HCM Excellence Conference, held Jan. 30-Feb. 2, 2018, in Palm Beach Gardens, FL.